Welcome to understanding that much Revelation Bible prophecy is now fulfilled. 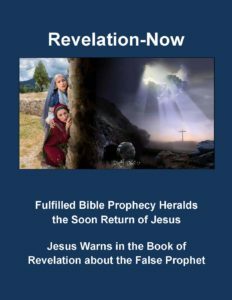 Revelation-Now provides a full array of resources regarding the book of Revelation prophecies. You can also find more at our YouTube site and Facebook Page. The Book of Revelation is a strong warning from Jesus about false Islamic teaching that would later come into the world. Much of the book of Revelation prophecies are fulfilled. Revelation is the final book of the Bible and tells what would come after the Apostles. Much more Revelation prophecy is fulfilled than most Christians know today. You can trust the words of Jesus. Our Muslim friends need to know Revelation Bible prophecy is a warning about their beloved Prophet Mohammad, who is actually the False Prophet of Revelation. The writings of the New Testament are the inspired Word of God and are complete. No additional Word was needed. The Qur’an is not from the true God because it gives a false story about Jesus. Do not follow the False Prophet. The Book of Revelation helps you learn the truth of Jesus. Jesus is God and is the only path to heaven. Jesus is returning soon. I am giving you my personal testimony to show you that God is real and deserving of our worship and praise. I did not earn or deserve any special treatment. But God reached out to save me. Some years ago two angels saved me out of the ocean. In the past year I have been visited by the Holy Spirit in dreams more than ten times. After a woman left Islam and accepted Christ I stood in the heavenly Jerusalem with thousands of angels praising God. I have also seen the Lion of Judah. I have been given a clear message to tell you. Jesus is really the Son of God and He is returning soon. This is Revelation Bible prophecy. The way to Heaven is narrow and anyone who denies Jesus is God will not enter Heaven. In the Book of Revelation Jesus warns us about a False Prophet. Nearly 600 years after Jesus said this Mohammad fulfilled all of the warnings from Jesus. If you are Muslim, we want you to know the truth of Jesus, the Son of God. The sacrifice of Jesus is the only path to heaven. There is no other way. The prophet you were taught to respect and recited the words in the Koran was a False Prophet. Jesus told us this long before it happened. It is the Revelation prophecy of what is to come in the last days. Jesus warned us about the False Prophet. The False Prophet was Mohammad. Mohammad did everything Jesus warned us he would do. Listen to Jesus. Do not believe the words of the False Prophet. Only the Bible is the true Word of God. Because Jesus said this many hundreds of years before Mohammad was born, the Bible must be true. Revelation Bible prophecy strongly warns us to avoid an IMAGE and a MARK that represent worship to a false god instead of Jesus. The MARK is the Islamic Shahada statement of faith to Allah, and the IMAGE is the Kaaba in Mecca to pray to a false god. This message is about the truth of Jesus. If you are a Muslim the truth of Jesus is different from what you were taught, but you must know the truth. 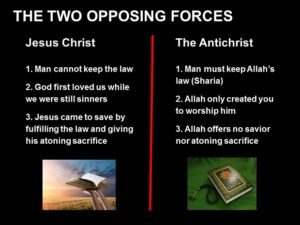 The Bible and the Islamic Koran have opposite facts. The Bible says Jesus is the Son of God. The Islamic Koran says Jesus is not God, but just a prophet. The Bible says Jesus was crucified for our sins and rose to life on the third day. Muslims are taught this did not happen. The Koran says to pray the House of Allah, the Kaaba in Mecca, Saudi Arabia. In the Bible the prophet Zechariah says this House is wicked! Zechariah said this long before the Kaaba was built. The demonic Beast of Babylon dwells in the Kaaba house after coming up from the Abyss. Muslims do not know that their two most important pillars receive the most wrath from the true God. The Shahada, which says there is no God but Allah is the Mark, and the Kaaba (the “House of Allah”) is the Image that God warned us about in book of Revelation prophecies. Soon Jesus will return! Pray for all Muslims to receive the Holy Spirit while there is still some time. They can only be saved by understanding Jesus is the Son of God and not a prophet. 1. Help all the lost–especially Muslims–see God’s true Scripture of Jesus and forgiveness. Know that Jesus is the true Son of God. 2. Understand Bible prophecy as it relates to Christian Biblical truth and to avoid false doctrine. 3. Prepare for the end times and the soon return of Christ. The three goals are divided into thirteen lessons. You can begin learning about all the key elements in understanding the book of Revelation prophecies in our lesson series. We recommend learning them all and beginning with the Lesson 1 – Inviting Muslims to Know the Love of Jesus Christ. Allah or Jesus? Who is the true God? Many of us have Muslim friends or coworkers, or perhaps you are a Muslim. We welcome everyone and know many Muslims are curious about Jesus and want to know more. The Koran (Surah 5:46) states “And in their footsteps, We sent Jesus son of Mary, confirming the Torah that had come before him, and We gave him the Gospel, wherein is a guidance and a light.” We start in Lesson 1 by sharing a perfect and uncorrupted Gospel text from Isaiah found in the Dead Sea Scrolls by two Muslims. When we know the end times involve Islam, much of the Revelation Bible prophecy in the books of Daniel, Ezekiel and Revelation are easier to understand. Lesson 2 starts by explaining Bible prophecy and Islam. It explains who the false prophet is and the mark of the beast. Lesson 3 shows Bible prophecy fulfilled since 1948. Lesson 4 covers the first two Islamic woes outlined in Revelation 8-11. Lesson 5 covers the restoration of Israel as foretold in Ezekiel 37 and Revelation 11, with Operation Ezra and Nehemiah, and Magic Carpet that saved nearly 1 million Jews from Islamic countries. It also explains the Two Witnesses. Revelation Bible Prophecy – Victory in Jesus! Zechariah 12:10 tells us at the Second Coming all will recognize Jesus as God and as the Messiah, and will mourn their mistake. After Gog is killed in Ezekiel’s War, Satan as the Man of Lawlessness will be revealed again in the last days. Paul tells us Christ will return after this happens. The Man of Lawlessness is also called the antichrist. The antichrist is Satan, not a human being. Some people think he is a human, but no Muslim will ever worship a man. The Bible warns us about a spiritual war against Jesus, the Son of God. Lesson 7 shows the second and final invasion of Israel into Jerusalem and the defeat of the Islamic armies by the return of Christ. Jesus will provide a perfect kingdom for all who believe in him. Photo & video credits: Getty Images, Shutterstock, Reuters, Israel Photo Collection, Israel Government National Photo Collection, Jewish Agency for Israel Photo Collection.